A three-dimensional integrated circuit (3D IC) is a package with multiple layers of silicon wafers stalked together, along with electronic components using through-silicon vias (TSVs),while a 2.5-dimensional integrated circuit (2.5D IC) is a package with an active electronic components (for example, a die or a chip) stacked on an interposer through conductive bumps or TSVs. The global 3D IC and 2.5D IC market is expected to increase to USD 170.46 Billion by 2022, at a CAGR of 38.30% between 2016 and 2022. Major upcoming/trending technologies and products in the global 3D IC and 2.5D IC market include heterogeneous 3D integration, hybrid memory cube, computing and data centers, and 2D block assembly into 3D chips. This report provides a detailed analysis of the 3D IC and 2.5D IC market based on packaging technology, application, end-user industry, and geography. During this research study, major players of the 3D IC and 2.5D IC market ecosystem in various regions have been identified and their offerings, regional presence, and distribution channels have been understood through in-depth discussions. To find the overall market size, top-down and bottom-up approaches have been used to estimate the sizes of other individual markets by using percentage splits from secondary sources such as Hoovers, Bloomberg Business, Factiva, and OneSource and primary research. The entire procedure includes the study of the annual and financial reports of the top market players and extensive interview of industry leaders such as CEOs, VPs, directors, and marketing executives for key insights (both qualitative and quantitative) pertaining to the market. The figure below shows the breakdown of the primaries on the basis of the company type, designation, and region conducted during the research study. The ecosystem of 3D IC and 2.5D IC market comprises a network of integrated circuit designers, raw material suppliers, Foundries, foundries, and Outsourced semiconductor assembly & testing services (OSATS) players among others. The key companies in the 3D IC and 2.5D IC market are Taiwan Semiconductor Manufacturing Company Ltd. (Taiwan), Samsung Electronics Co. Ltd. (South Korea), Toshiba Corp. (Japan), Advanced Semiconductor Engineering Group, (Taiwan), and Amkor Technology (U.S.). The prominent companies in the markets include the well-established, financially stable and technically expertise players that have been operating in the industry for several years and have diversified product portfolios, proprietary technologies, and strong distribution networks through collaborations and acquisitions. The global 3D IC and 2.5D IC market is expected to increase to USD 170.46 Billion by 2022, at a CAGR of 38.30% between 2016 and 2022. Some of the key factors driving this market are increasing need for advanced architecture in electronics products, trend of miniaturization of electronic devices, and growing market of tablet smartphones and gaming devices. 3D TSV in 3D IC and 2.5D IC market is estimated to grow at the highest CAGR during the forecast period. 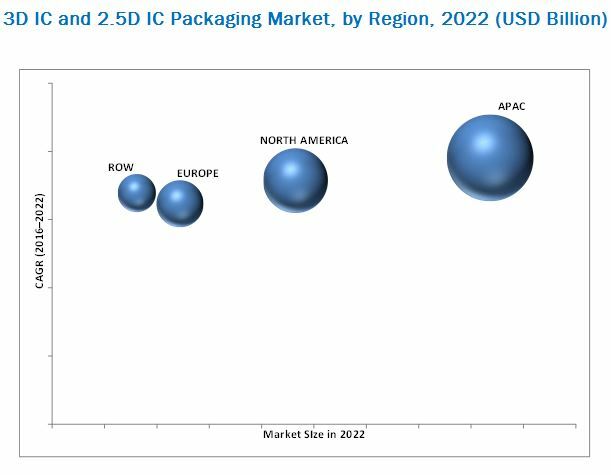 The major factors driving the 3D IC and 2.5D IC market for 3D TSV include highest interconnect density and greater space efficiencies in 3D TSV compared to all other types of advanced packaging, such as 3D WLCSP and 2.5 D.
Logic market accounted for the largest share of the 3D IC and 2.5D IC market in 2015. The demand for 3D IC and 2.5D IC packages in logic is growing because of high product availability. Increasing manufactures in this market offers innovative products with advanced packaging. For instance, Intel Corp. (U.S.) is driving the market for advanced packaging in field programmable gate arrays (FPGA). Global companies started introducing 3D logic ICs in different programmable logics to ensure the operational efficiency with added convenience and increased productivity. Among all the major end-user industry applications of the 3D IC and 2.5D IC technology, the market for smart technologies is expected to grow at the highest CAGR during the forecast period. Internet connectivity, connected devices, Wi-Fi, Bluetooth, and GPS are some of the high-end connectivity features incorporated in smart gadgets and devices in the smart technologies industry for communicating with other devices. Many ICs need to be incorporated in a single chip module for reducing the board space, cost, and the overall time to market. Thus, this is expected to propel the 3D IC and 2.5D IC market at the highest rate during forecast period in smart technologies industry. In terms of geographic regions, APAC acquired largest market for 3D IC and 2.5D IC in 2015. The large market in APAC is owing to the broad scope of 3D IC and 2.5D IC packages in various consumer electronics applications, particularly in smartphones and tablets. This is mainly because of the high population density in the APAC region. Also the presence of big companies in this sector such as Samsung Electronics Co. (South Korea), Sony Corp. (Japan), and many others drives the 3D IC and 2.5D IC market in the APAC region. Thermal-related issues caused by higher levels of integration and high unit cost of 3D IC and 2.5D IC packages are the retraining factors for the growth of 3D IC and 2.5D IC market. Taiwan semiconductor manufacturing company limited (Taiwan) is one of the leading companies in the 3D IC and 2.5D IC market, followed by Samsung Electronics Co., Ltd. (South Korea) providing the advanced packages consisting 3D wafer-level chip-scale packaging and 3D TSV integration to address the need of high performance and miniaturized products. Companies are strengthening their product portfolio with new launches by increasing R&D investments. 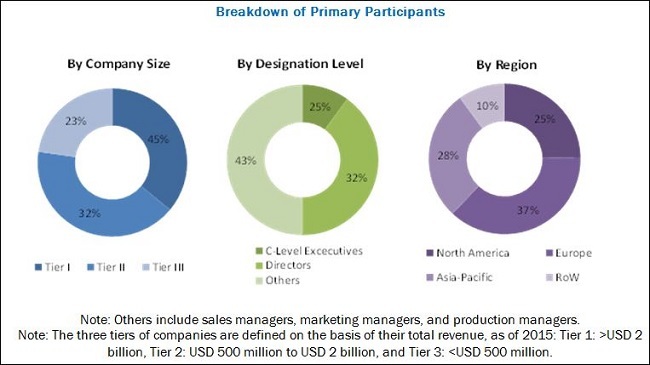 Key players in this market are increasingly undertaking partnerships and collaboration as major growth strategies to develop new technologies, to efficiently cater to the growing demand for 3D IC and 2.5D IC products from the end users, and also to expand their global footprint by offering their products in all the major geographies. Figure 47 3D IC and 2.5D IC Market for Telecommunication in Chine Expected to Grow at the Highest Rate During the Forecast Period. Figure 51 3D IC and 2.5D IC Market for Telecommunication in Canada Expected to Grow at the Highest Rate During the Forecast Period.